The CatEye Loop 2 is a fantastically versatile USB-rechargeable front bike light. Its light weight and its instant mounting system makes the CatEye Loop 2 an excellent choice - especially as a secondary light. Fits any size of handlebars. Approximately 25mm (one inch) diameter, a CatEye Loop Light takes up very little space. 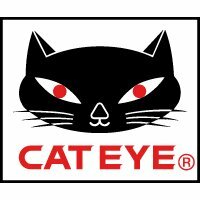 The CatEye Loop fits bars already crowded with a bell, a computer and so on. Perfect for a kids' bike's narrow bars. The laddered rubber mounting strap makes it easy to switch the CatEye Loop 2 RC Front Light between bikes. Its compact size and light weight make the Loop an excellent secondary light to carry along with you, say, for getting home safe should your primary light fail, or to lend to a friend. USB-rechargeable for economy and convenience. Run Times: up to 15 hours in flashing mode from its rechargeable Li-ion battery. Only 19g - weighed with its rubber fitting strap at Bike Co-op HQ in October 2015.